Supermotos are basically the go-karts of the two-wheeler world. They’re light, chuckable and offer a whole lot of sideways fun around a tight track. 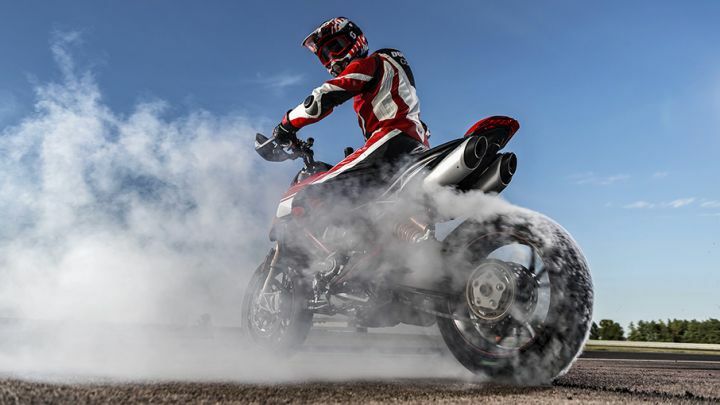 Ducati’s Hypermotard range is well known for its agility, coupled with its wild engine. Unveiled at the 2019 EICMA show, the new Hypermotard 950 isn’t just a lazy facelift. Ducati has tinkered with the motorcycle quite a bit in a bid to make it an even more wholesome package. 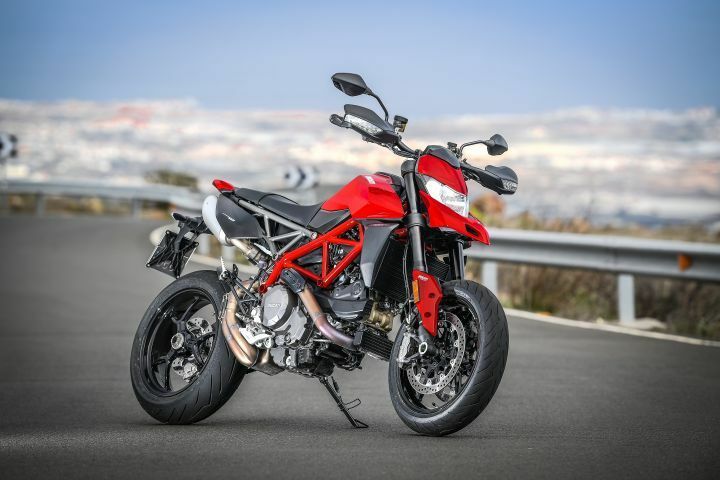 The Ducati Hypermotard 950’s design language is more in tune with the first-gen Hypermotard, especially the exhaust routing and the tail section. Up front, the compact headlamp and the beak-like front fender exude an unmistakably supermoto styling, complemented by a new, really long, flat seat. The seat is designed to be slimmer than the one before, and it has resulted in a massive 53mm shorter inner leg curve! This should make flat-footing easier, especially for shorter riders and also help the rider in gripping the bike better. The aluminium handlebars are wider and should provide better leverage while attacking corners. Both brake and clutch levers are adjustable to suit different palm sizes. The instrument cluster is a full-digital TFT screen. Its design and interface are reminiscent of the one in the Panigale V4. It is compatible with Ducati Multimedia System (DMS) too. DMS enables smartphone pairing which lets riders access functions like incoming calls, text messaging and music via the switchgear. Perfect for us millennials, right? 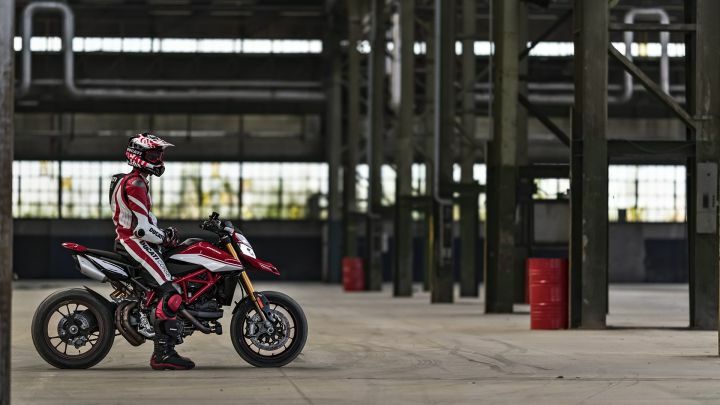 Though the Hypermotard 950’s engine capacity has remained unchanged, the engine itself has undergone a number of changes. At 114.2PS and 96Nm, the 937cc Testrastretta L-twin liquid-cooled motor makes 4PS and 1Nm more than the previous-gen bike. The peak power arrives at 9000rpm, whereas 80 per cent of the peak torque is available from as low as 3000rpm. As a result, the motorcycle should offer even better low-end performance. All these improvements in performance are courtesy of the new 53mm throttle body, new ECU and a bumped up compression ratio (from 12.6:1 to 13.3:1), to name a few. Furthermore, the 6-speed transmission with slipper clutch now gets hydraulic actuation instead of a cable-operated one for an effortless clutch lever action. The motor is also 1.5kg lighter than the older one. Electronic aids include three-level Bosch Cornering ABS with the Slide by Brake function (with setting 1), Ducati Traction Control, Ducati Wheelie Control and three riding modes (Sport, Touring & Urban). They all work in conjunction with a Bosch 6-axis Inertial Measurement Unit (IMU) which senses the motorcycle’s pitch, yaw and roll angles in realtime and controls the rider aids accordingly. The Hypermotard 950 is built on a new steel trellis frame with tapered tubing and is 1kg lighter than the older one. The rear features a trellis subframe that is quite similar to the first-gen Hypermotard. Up front, it gets fully adjustable 45 mm Marzocchi forks with aluminium fork bodies/tubes for half a kilo worth of weight reduction compared to the older one. There’s a Sachs monoshock at the rear that’s fully adjustable as well. Braking duties are handled by a pair of Brembo M4.32 radial monobloc calipers grabbing the 320mm front discs. The disc features aluminium flanges to further shed 600 grams. You might think that’s not much, but this is, in fact, significant, considering the fact that brakes contribute to the unsprung weight where even minor weight differences can change the dynamics of a motorcycle. At the rear, the bike uses a 245mm disc with Brembo single-piston caliper. The Y-spoke aluminium wheels are 800 grams lighter (in total) and are wrapped with Pirelli Diablo Rosso III tyres. At 200kg kerb, this motorcycle is 4kg lighter than its predecessor. There’s an even more mental Hypermotard 950 SP variant too! 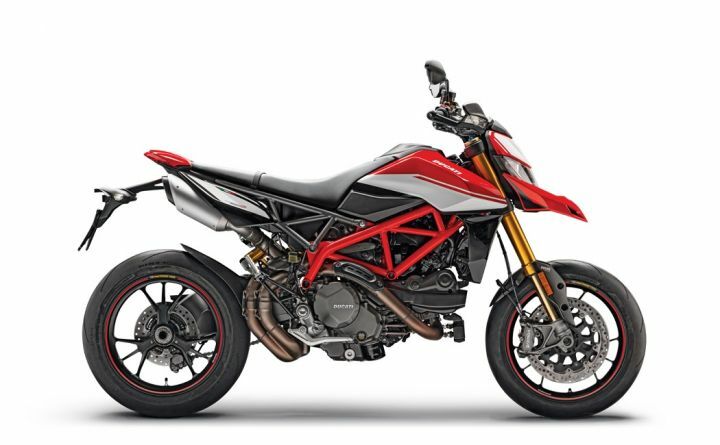 The Ducati Hypermotard 950 SP version comes with top-of-the-line fully adjustable Ohlins suspension (48mm USDs up front and rear monoshock with progressive linkage). They offer 15mm and 25mm more wheel travel at the front and rear respectively. Consequently, the maximum lean angle on both sides has gone up from 44 to 47 degrees. For further weight savings, the front mudguard and belt covers are made up of carbon fibre and the wheels are forged Marchesini units. All these features have resulted in a 2kg reduction in kerb weight compared to the standard model, at 198kg. The motorcycle also gets a bidirectional quick shifter as standard and an exclusive SP colour scheme. It is even synced with the IMU, allowing the rider to use the quickshifter even when the bike is leaned over. In the US market, the standard variant is priced at $13,295 (Rs 9.49 lakh), and the SP variant costs $ 16,695 (Rs 11.91 lakh). Its predecessor, the Hypermotard 939 is still sold in the Indian market for Rs 11.17 lakh (ex-showroom). Expect Ducati to launch the new version by the end of this year at the earliest. The supermoto segment is quite niche in the country, and the Hypermotard is one of its kind in our market. 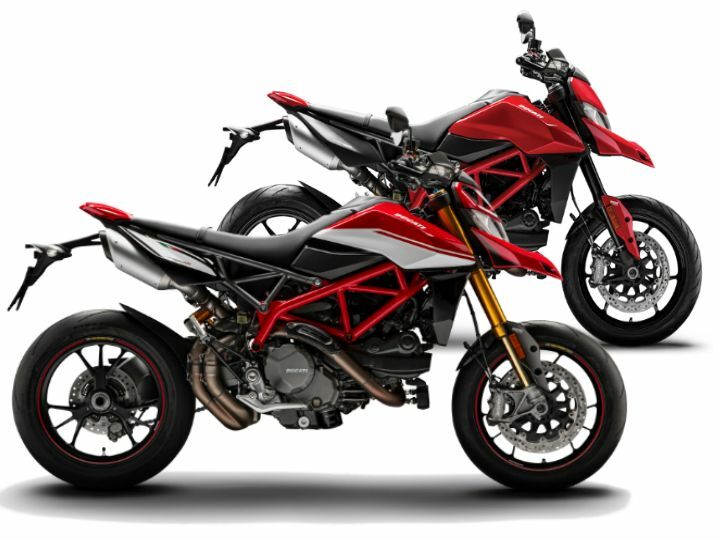 The only rival for the Hypermotard is the Aprilia Dorsoduro 900.